Vegas Palms Casino is part of the distinguished Fortune Lounge Group, so players know they will have an enjoyable online gaming event, along with a safe and fair experience. 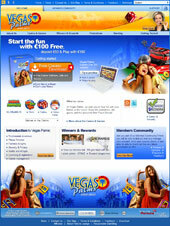 Vegas Palms online casino is operated and owned by Digimedia Ltd and licensed by the Lotteries and Gaming Authority of Malta, since its creation in 2000, it has become an ideal place to play for many gamers, with its generous bonuses and promotions, colossal assortment of online casino games and friendly 24/7 customer support in multi-languages. Security: Players are guaranteed 100% secure and safe transactions and confidential personal data security with the latest in 128 bit encryption protocols. Vegas Palms Casino continually maintains and updates security systems. Vegas Palms Casino has been awarded the eCOGRA seal of approval for its responsible operations and safe and fair gaming procedures. 200% Deposit Bonus up to €100! New players to Vegas Palms Casino will be treated to a 200% bonus up to $100 on their first real money deposit, which sees them playing with $150 if making a deposit of $50. These players can also claim 50 Free Spins on Riviera Riches slot if playing on their desktop or 50 Free Spins on the Avalon mobile slot game. Once a second deposit is made, players receive 50 Free Spins on the Game of Thrones slot when playing on desktop or on the Avalon slot for mobile fans. Players earn another 50 Free Spins when making their third deposit on the Lucky Witch slot for desktop play or the Avalon slot if they gamble on the go. The Free Spins offer is available 7 days from their first deposit. The Fortune Lounge Group is giving away three Las Vegas double prize packages to lucky players. All you need to do is play your favorite Microgaming games at Vegas Palms Casino, and you will earn reward points. For every 100 reward points you earn, you will earn entry into the Las Vegas draw. In addition, each time you fill up the arrow and reach 100%, you will get the chance to scratch for an instant prize! Once a player has registered a real money account and makes their first deposit, they are automatically registered into the Vegas Palms Rewards Program. All players start at the Silver level and can progress up to the Diamond level just by playing their favorite games. Players are rewarded with greater benefits as they progress up each level to include enhanced loyalty points scale, birthday bonuses and special promotions and events. Vegas Palms Casino uses the unmatched Viper Microgaming software platform with over 400 thrilling online games for players to choose from. Microgaming understands player’s needs and releases new games on a regular basis with stunning graphics and clear special effects. Vegas Palms online casino provides players with all their favorite games to include blackjack, roulette, baccarat, craps, video poker, keno and huge progressive jackpot games. Slot Players will be astounded at the 180 online slot game selection from classic three-reel slots to the multi-reel, multi-payline slots with wild symbols, scatter symbols, free spins and substantial payouts. Vegas Palms also offers online live poker table games and live tournaments in slots and blackjack. Players on the go can use their mobile devices for quality online gaming wherever they happen to be. Vegas Palms Casino offers a huge variety of banking options. Credit Cards (Visa, MasterCard, JCB, and Diners Club), Debit Cards (Visa Electron, Maestro, Delta Card), PostPay, Neteller, Skrill (Moneybookers), Click2Pay, ECO Card, ClickandBuy, EntroPay, PaySafe Card, Ukash, InstaDebit, eCheck, DirectBank, iDeal, Poli, SoFort, UseMyFunds, Ticket Premium, NeoSurf, Instant Banking, MultiBanco, Teleingresso, EPS, InstantBank, GiroPay, Unet, Euteller, Ewire. Neteller, Moneybookers, EcoCard, Click2Pay, EntroPay, EZIPay, Check, Bank Wire / Swift, Solo / Maestro Debit Card, VISA Credit/Debit Cards, InstaDebit, UseMyWallet.